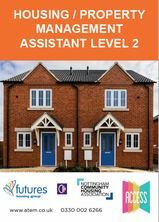 The level 2 apprenticeship has been developed to prepare an apprentice for a supporting operational role within the housing/property management sector. The standard will meet the needs of professionals within the private and affordable housing sectors, and is applicable to all sizes of organisation. The level 3 apprenticeship prepares an individual for a range of general housing/property management duties leading to operational or specialist roles. The standard will meet the needs of professionals within the private and affordable housing sectors, and is applicable to all sizes of organisation. ​The level 4 apprenticeship has been developed to prepare an apprentice for a senior role within the housing/ property management sector. The standard will meet the needs of housing/property professionals within the private and affordable housing sectors and is applicable to all sizes of organisation. Please visit our vacancies page to see if we have any current Housing - Property Management apprenticeships. Alternatively, if you wish to express your interest in doing a course then please complete our application form and we will be in contact with you.